This entry was posted in Cupcakes, Food and Recipes, Seasonal, Spring/Easter and tagged Buttercream frosting, Cupcake, dessert, Easter, Easter Egg Cupcakes on March 30, 2018 by nancyc. Here’s a fun fall cupcake decorating idea–Owl Cupcakes! There are several different ways you can make owl cupcakes, and you may have already seen other ideas for these on different sites. I thought this idea from Recipe Snobs was one of the cutest and easiest–all you need are cupcakes, Oreos, and M&M’s! Make sure you generously frost your cupcakes, because the frosting is what holds your Oreo “eyes” and “ears” in place, as you press the cookie halves into the top of the cupcake. Hope you have fun making these! Split the Oreo cookies in half crosswise, so the cream is all on one half and the other half is plain (the directions on Recipe Snobs say you can microwave 5 cookies at a time for 3-5 seconds to help keep the cream side solid; I didn’t try this, but it’s something to keep in mind if you’re having problems splitting the Oreos. Also, you can use a frosting spatula or knife to help split the cookies. And you may need to use a small knife to scrape off small crumbs from the cream filling side or to smooth down the filling after splitting the cookies). For the eyes: Press two of the cream filling cookie halves, with sides almost touching, gently into the middle of a frosted cupcake (part of the cookie halves will extend beyond the cupcake). Press the M&M’s, with the M side down, into the cream filling on each cookie half (refer to my photos for where to place the M&M’s). For the ears: Use the plain Oreo halves for the ears above the eyes (they kind of look like eyebrows, too!). Score the flat smooth cookie sides with a small sharp knife down the center so you get a clean break for your two ears. OR, if you want thinner ears like I made on these cupcakes, score the cookie half on each side not quite to the center; this will leave you with an extra center strip of cookie (which you can eat or discard–I ate mine! 🙂 ). Score and break all your plain cookie halves. Take two of the “ears” that you’ve made from the plain cookie halves and press them into the frosting right above the “eyes,” slightly slanted downward and almost meeting at the upper center of the cupcake (the bumpy side of the cookie should be showing from the front). For the “beak,” press an orange M&M (on its side) in the lower center, right below where the cookie “eyes” meet on the cupcake. There you have it! Enjoy eating these fun cupcakes! What’s your favorite way of decorating cupcakes for fall? This entry was posted in Autumn/Thanksgiving, Cupcakes, Food and Recipes, Food Presentation, Seasonal and tagged chocolate, Cupcake, fudge frosting, M&M's, Oreo, Owl Cupcakes on October 12, 2013 by nancyc. Chocolate cupcakes are a great dessert any time of year, and I was wanting to make something chocolatey. After trying several recipes that I thought were so-so, I went to Martha Stewart’s site and decided to make her Chocolate Cupcakes and Ultimate Chocolate Frosting with a few little changes. I’m so glad I did! I really like these cupcakes! The batter is thick, smooth, and creamy. And the cupcakes rise and bake up so nicely with rounded tops. Best of all, they have a great chocolatey taste! The frosting is rich, thick, and definitely fudgy–much, much better than using a can of frosting! Preheat oven to 350˚F. Line a 12-cup muffin pan with paper liners. In a medium bowl, sift together the cocoa powder, flour, baking powder, and salt; set aside. In a large bowl or mixing bowl, cream butter and sugar until light and fluffy. Add eggs, one at a time, beating well after each addition. Add vanilla and blend well. Then add flour mixture in two batches, alternating with sour cream and beginning and ending with flour (if using a mixer, set the mixer to low speed for this). Spoon batter into cups, filling each 3/4 full. Bake at 350˚F for 20 to 23 minutes, or until toothpick inserted in centers comes out clean (I baked my cupcakes for 23 minutes). Cool cupcakes in pan 5 minutes, then transfer to a wire rack to cool completely. 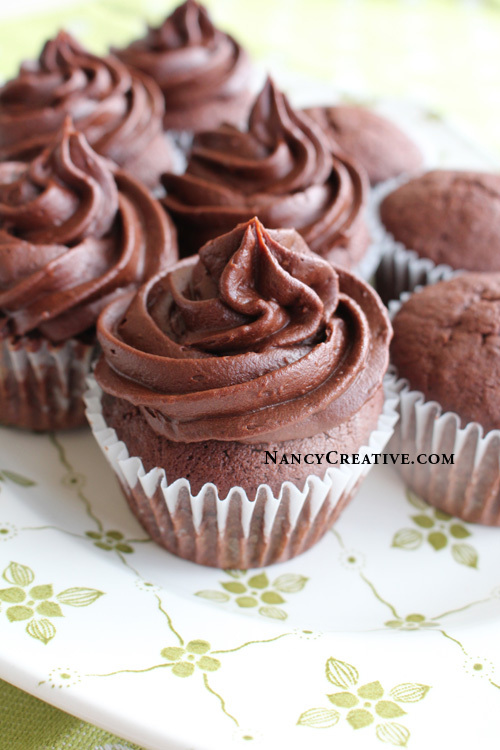 After cupcakes are completely cooled, frost with the Fudgy Frosting. Sift confectioner’s sugar and cocoa powder together in a medium-size bowl. Add butter, Half & Half (or milk), and vanilla. Stir ingredients until smooth. Note: This is a very thick, fudgy frosting–if you want to frost your cupcakes with a decorator tip, thin frosting out a little by adding an extra 1 1/2 Tablespoons of Half & Half or milk. If you’re not big on lots of frosting, these cupcakes are great with a lighter amount, too–if you like to frost lightly, you could halve the frosting recipe. Hope you enjoy the cupcakes! 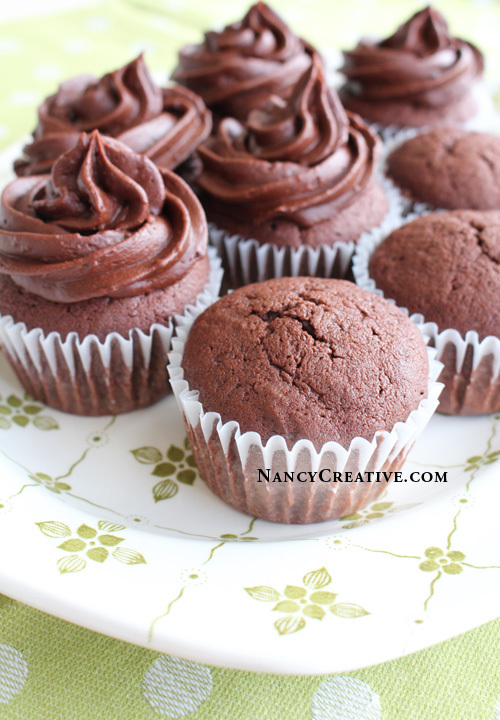 Do you have a favorite chocolate cupcake recipe? This entry was posted in Cupcakes, Food and Recipes and tagged Butter, Chocolate Cupcakes, Cupcake, Fudgy Frosting, Greek yogurt, Vanilla extract on October 10, 2013 by nancyc.